Why make your outdoor landscape enjoyable only in the daylight? Outdoor lighting transforms your yard into a usable and gorgeous space once the sun goes down. With the Phoenix heat, it is not uncommon to spend more time outdoors in the evening and twilight hours than in the heat of the day. 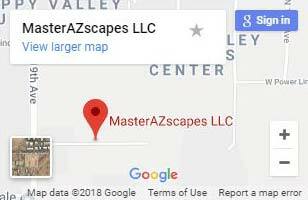 Let MasterAZscapes LLC illuminate your yard or the outside of your business with outdoor lighting Phoenix has come to love. 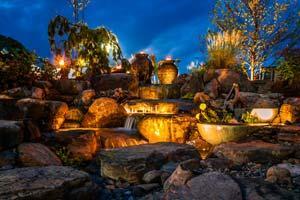 Outdoor lighting creates a specific mood that injects magic into your landscaping. You can highlight specific focal points or accent several areas. These can include anything from a water feature to decorative garden lanterns. Lighting not only creates a romantic ambiance it also greatly improves the functionality of your outdoor spaces, making it an excellent landscape design investment. Our outdoor lightning professionals opt for the most energy-efficient lighting so you can spend time in your yard deep into the night without worry about a large increases to your utility bill. We also have nearly limitless options on design, from Moroccan-style lanterns to a comfy, country feel—and everything in between. Our landscape designers have the expertise to not only plan your outdoor lighting, but also install it for you. We have electricians to install the outlets and wiring necessary to bring power to where it is needed for the desired outcome. Whether you are installing a new landscape design or simply adding lighting to your existing one, we work with you to create the look and functionality you need. We start by talking to you and looking at your space. We discuss everything from which areas receive the most foot traffic to how and where you might entertain. Are you planning to cook or dine outside? Are there stone steps that could be made safer with lighting? How about security lighting around windows and entrance ways? 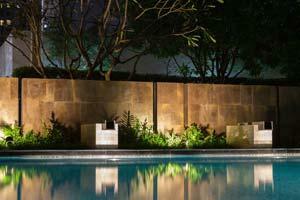 We include these types of pragmatic decisions in the design of your outdoor lighting as well as artistic flare. Come look at our catalogs and portfolios to gain some ideas as to what can be accomplished with landscape lighting in Phoenix. Whether you already have a good idea about what you are looking for or you need a little help pulling an idea together, we can help. We are happy to check out your home or business and start putting together some plans based on your needs and creative vision. Contact us today for your free consultation. Let us breathe new life into your yard with outdoor lighting Phoenix has come to trust for beauty and excellent implementation.